Muscatine, Iowa, which bills itself the ‘Pearl of the Mississippi’, is a small city of about 25,000 residents which lies between the Quad Cities and Iowa City and about 15 miles south of I-80. Like many small upper Mississippi river towns, Muscatine has a rich manufacturing heritage, and is also chock full of scenic beauty and traditional Americana. The main shopping area of Muscatine, including the mall, is located near the intersection of Park Avenue (Business 61) and the US 61 Bypass on the north side of town. I suspect, though, that many people from Muscatine and the surrounding areas also shop in Iowa City at Coral Ridge Mall and at both Northpark and Southpark Malls in the Quad Cities, all of which are regional/super regional malls and no more than 30-45 minutes away. Muscatine Mall opened in 1971, predating the enclosed malls in the Quad Cities by several years and Coral Ridge Mall near Iowa City by 27 years. In fact, Muscatine Mall enjoyed relative success well after all of the competition emerged, not going downhill until around 2002. We’re missing some information about the earlier years of Muscatine Mall, but we know it was anchored by Wal Mart, Von Maur, and JCPenney by the late-1980s. Ancillary stores around that time included B. Dalton, Walgreens, Musicland, Radio Shack, and Foot Locker, around 50 stores in all. Big changes came in the late 1990s and early 2000s, however, beginning with the departure of the north anchor, Wal-Mart, in 1997. 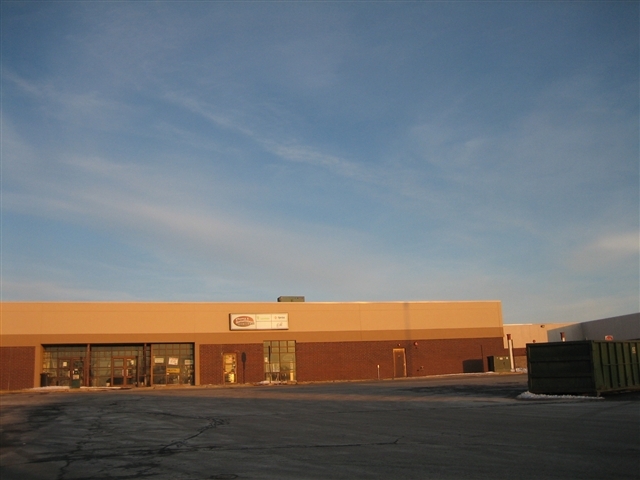 However, in 1998, Menards swooped in and took the empty space, making Muscatine Mall one of the few malls anchored by a home improvement retailer. Soon after, Von Maur left the south anchor spot vacant, only to be replaced by Staples. 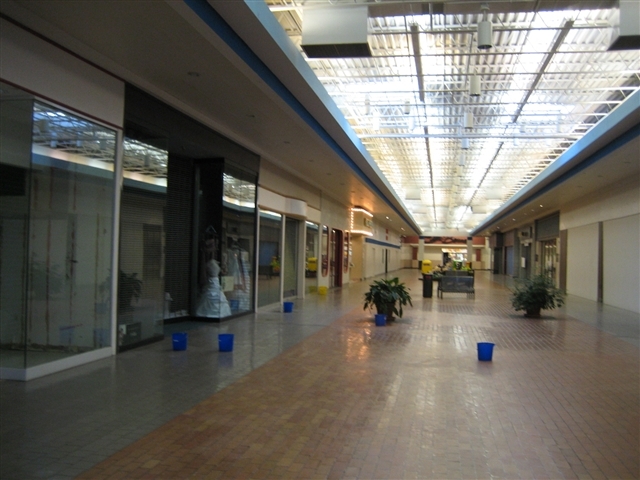 In 1999, a redevelopment plan was announced by Landau & Heyman, Muscatine Mall’s owners, which would flip the inside out and remove the enclosed portion of the mall. However, this never happened. By the year 2000, the mall had transitioned from traditional to non-traditional, with an uncertain future. In 2002, both Staples and Walgreens called it quits and the south anchor once again became vacant, only to be replaced by Elder-Beerman in 2003. Unfortunately, having 3 solid anchors was not enough to sustain Muscatine Mall’s success, and stores began exiting en masse around the same time Staples pulled out. 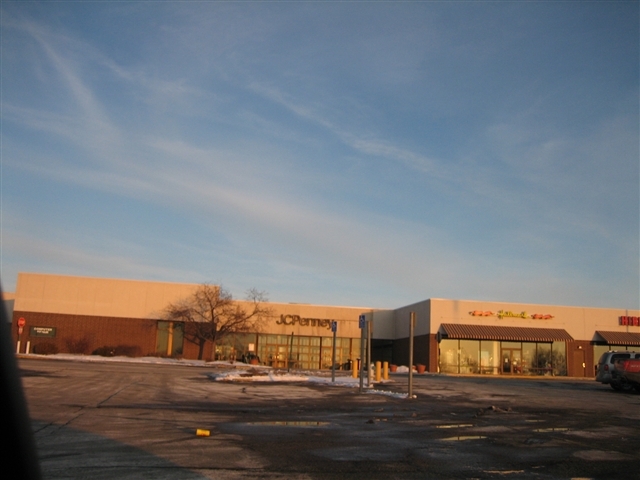 Today, Muscatine Mall is home to only a handful of stores, most of which have exterior entrances only. 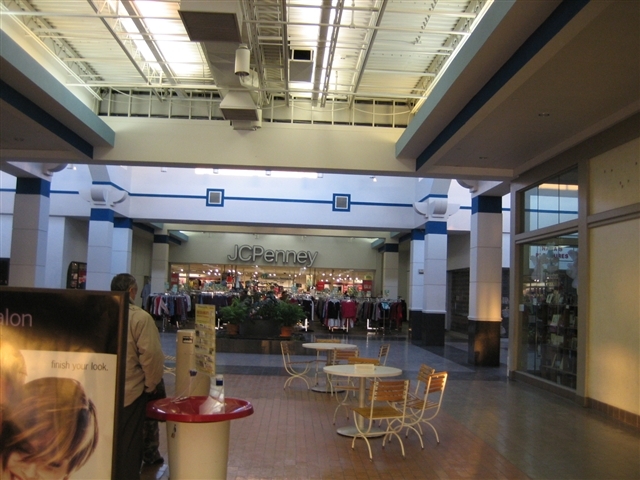 The enclosed corridor is barren except for the Plaza Theaters, a Time Out arcade, GNC, a Christian book store, a few other stores and the entrance into JCPenney, which is at the back of the mall. The frustration from locals is evident even from teens who don’t wish to drive to Iowa City or to Davenport to shop and hang out at the mall. 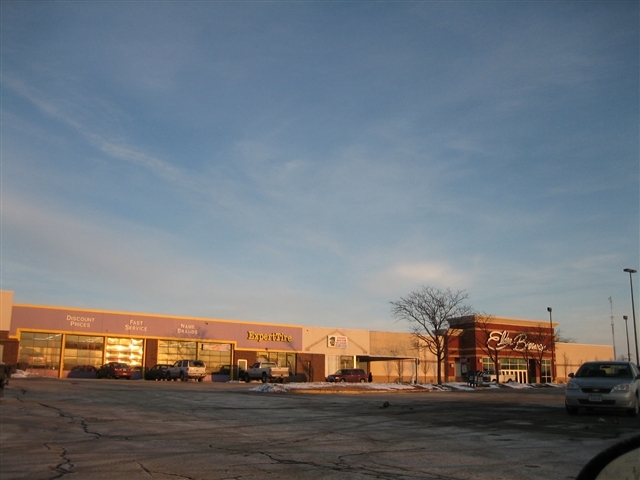 In July 2006 Landau & Heyman sold the mall to a group of local businessmen, and in December 2006 minutes from a Muscatine City Council meeting indicated they were seeking to create a TIF for the mall redevelopment. 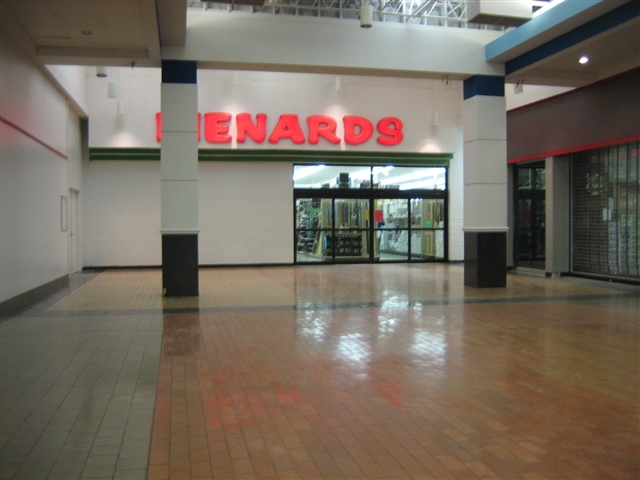 As of February 2007, work is underway on the north entrance of the mall near Menards, and it is currently closed off. Mall owners claim several national retailers are interested in the mall post-renovation. 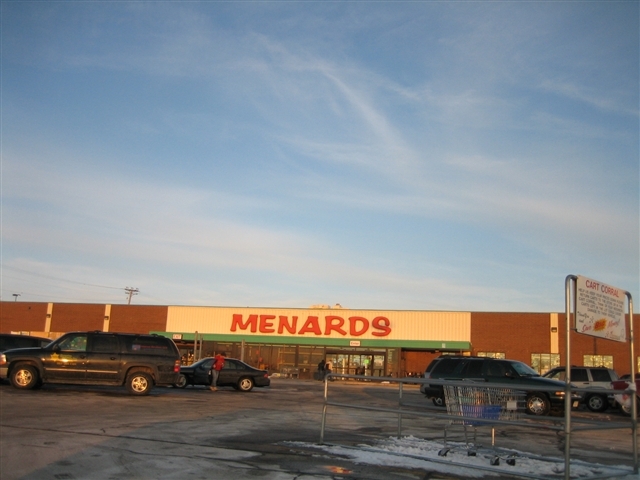 Also, Menards is leaving the mall for newer digs nearby in 2008. What will become of Muscatine Mall? Will plans for redevelopment some 8 years in the making finally come to light and save the mall? 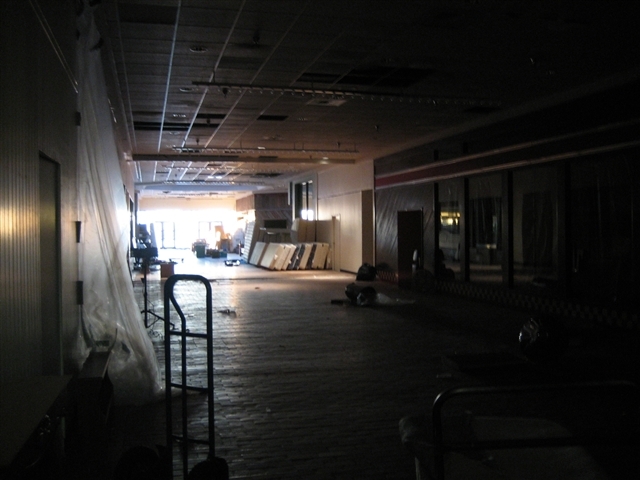 Unlike many dead malls, it’s certainly possible. Leave your comments and messages concerning Muscatine Mall below. The photos were taken February 18, 2007. Pure speculation on my part, but I would bet that that Wal-Mart/Menard’s may have originally been a Woolco, especially if the mall dates from the 1970s. The Wal-Mart/Menards was a Woolworths originally. Woolco was part of Woolworths, but I don’t think we every used that store name here. I’ll speculate along with you Bobby. Had to of been a WoolCo. Wal-Mart didn’t start breaking into the Upper Midwest until the mid-1980s. All WoolCo stores here in Wisconsin became Copps (back when they had discount stores), but only for a short time (1983-1985) before making the jump to Wal-Mart in the late 1980s. Anywho…..woah! 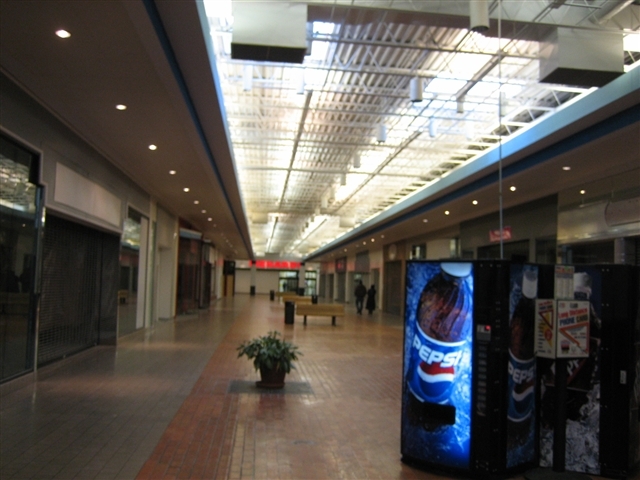 I recall seeing a few old news articles on the mall I mentioned in my Edgewater Mall (Manitowoc) submission…Lakeview Centre, that had grainy, poor quality (because they were digitalized scans), but I could make out the raised ceilings with fluorescent lights, and the lower clearances close to the storefronts with little lighting at all. This mall has about the same look inside, and it looks to me like this mall hasn’t been redone since its opening either! I’m suprised it lasted up through 2002 before taking a tumble. If I were a teen living in the area, I too, would be frustrated. I wonder how many screens are in that Plaza Theatre. Looks like theres one tiny little coffee shop there in front of JC Penney but thats it. Frustrating and boring for sure. In the 10th pic, I love how they have buckets strewn across the floor, presumably for catching dripping water, I also love their code of conduct int he 11th pic, wonder anything has ever had to be enforced. And of course, the fact I’ve read about several other malls on this blog where Wal-Mart used to have a store anchoring a mall(Skyline Mall of Albert Lea, MN, and Beaver Dam Mall in Beaver Dam, WI, as examples of what I mean) definately reinforce what I’ve noticed of them(since their stores in these malls closed, and that they built nearby stand-alone stores to replace the former mall stores). At least this blog has given me another good reason to dislike Wal-Mart now, lol…..
Plaza theaters are 4 screens according to cinematour. Marlborough Mall is doing quite well and is also anchored by a Sears. Although it still can’t compete with Sunridge Mall, just a few blocks away that just finished undergoing major renovations and has now been brought back to life from a dreary existence. Northland Mall is a dead-ish mall. I like to think of it has a power-centre with an indoor connection between the three anchors: Wal-Mart, Best-Buy and Winners (TJ MAXX). Other than that the mall is pretty quiet and the only thing that really keeps the mall part itself going are teenagers and students from the nearby junior and senior high schools who fill up the food court at lunch and generally hang out instead of going to class. Deerfoot Mall is more of an outlet mall as well. There is a Sears Factory Outlet store and not really all that much else, although it has recently been renovated, I haven’t been up that way in years. Discount stores still anchor tons of malls in Canada. I wouldn’t be surprised if Wal-Mart had more mall locations in Canada than in the US – and almost all of them are former Woolcos. (It should also be noted that Woolco held on longer in Canada – 1994 – than the US). I have a Wal-Mart RandMcNally Road-Map Book and it has a listing of all the Wal-Marts in North America. Theres a lot in Canada for sure, but it doesn’t even come close to the amount of locations in the US. I wonder if we’re ever gonna get Supercenters here, I know they built some Sam’s Clubs in Ontario. I don’t think Wal-Mart ‘originally’ located in malls on purpose. They moved into them during the 1980s by way of chain acquisitions, or filling in vacant anchor stores once housing other discount chains….such as in the example I put forth in my first reply to this entry. Wal-Mart follows ‘trends’…and back then the trend was the enclosed mall, thus it was only natural they moved into them for a time….abelt, by way of other chains going out of business. (WoolCo, Copps, PrangeWay, et al). I could be wrong though…maybe down South, and as far west as Arkansas, they were ‘original’ anchors to malls down there (like how WoolCo and PrangeWay anchored some malls initially up here in WI), but I’m not an expert on retailing down there. Matt from WI, you’re right – some malls (only a few that I know of, though) were indeed anchored by Wal-Mart from the get-go. A 1970s era dead mall in Joplin MO had Wal-Mart from day one. However, Woolco malls were quite common down South too, as well as many Kmart and Rose’s anchored malls. Ooooh… a code of conduct poster. Usually says no photography on there. I always goosepimples when I see one of those. Muscatine is the name of the city. This article should be updated. The mall isn’t really jumping, but where Menard’s used to be is now Shoe Sensation and there’s also Slumberland furniture. I believe there’s still a Younkers. There’s also a Community Action Agency, Jimmy John’s (a national/midwest sandwich shop), and some other random stores that have popped up like The Candle Shed. So, slowly but surely, maybe the mall is coming back to life. It’d be nice if they’d get a major retailer such as Old Navy or American Eagle in there, but I doubt that will ever happen. And anyway, aren’t malls supposedly more common throughout Canada, as opposed to the U.S.? I’m pretty certain I remember reading that there aren’t so many strip centers and outdoor shopping centers, and more malls up there(even ones where you only have say, a couple big box retailers clustered together). It wouldn’t surprise me though if malls were more commonplace in Canada, due to the weather being colder there. And speaking of those Code of Conduct posters at malls, I looked at the one posted just inside an entrance of Eastland Mall(in the area where I go to college) a few weeks back when I was waiting to transfer to another bus(as I got bored waiting for the bus to come), since I was curious if there were any specific rule(s) prohibiting or restricting photography. Yeah I was going to say in my first post here…..how ironic that PrangeWay caught that slightly-feared ‘Code of Conduct’ poster in the Elder-Beerman storefront pic. 99% of the time, one of those ‘codes’ is ‘No Photography or Video Recording in or around the property”. Always gives me slight goosebumps as well. Yes, photography is most often listed as prohibited on those signs; however. it is never illegal due to the 1st Amendment of the Constitution. The worst thing they could do is ask you to leave immediately and ban you from coming back, but usually they just politely say to stop. 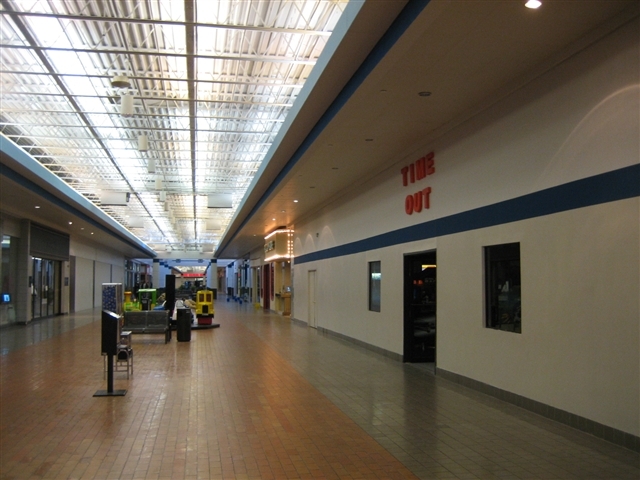 What is the dead mall in Joplin, MO? I was there last year and must have missed it. The now defunct North Town mall in Springfield, MO was anchored by Wal-Mart as an original anchor. There is a photo of the 1977 vintage store as it looked when it opened on DeadMalls.com. After years at that store, it looks as though they will likely level the rest of the mall to expand the small Wal-Mart to a supercenter. Thanks, Mike – I knew it was somewhere in missouri. It was Springfield, not Joplin. That’s what I was thinkin of. Back in the day….one of the big anchors too was HyVee before they built in the parking lot of the mall…..Also had Walgreens with Walgreens Restaurant. Pizza Hut was there….And, yes it was called Woolco…. Don’t forget Basking and Robbins and Whitey’s were other big draws. I live in Muscatine and the mall is undergoing restoration. I also grew up around the area, and when I was a little girl (early 1970s), the anchor stores were a Woolworth’s and a Ward’s. The Walgreen’s was in the center and also contained a sit-down diner adjacent to the primary pharmacy component. There were working fountains situated along the centers of the mall (ie. piazzas in a village). We used to throw coins into them when we would shop. There was also a HyVee grocery store on the north end of the mall (regional chain – like a Kroger’s or Food Lion). There is also more work underway from the city council to revitalize the HWY 61 corridor. In the summer of 1974 I transferred to Muscatine with the Woolworth Co. from Emporia Kansas. The large Woolworth store here was destroyed by a tornado and I moved to Muscatine. At that time, the Woolworth store was on the north end of the Muscatine Mall. I remember the resturant at the south end of the store before entering mall. In the pet department against the east wall was Dyna the Myna bird that had a large vocabulary. In the menswear department in the northwest corner, hung from the ceiling was the largest pair of bib overalls I’ve ever seen. They had to have measured at least four feet across the waist. I left Muscatine to move back to Emporia where I had come from to work at the Woolco store built where the Woolworth store had once stood a little more than a year before. Located inside the mall was my first introduction to a Maidrite shop. 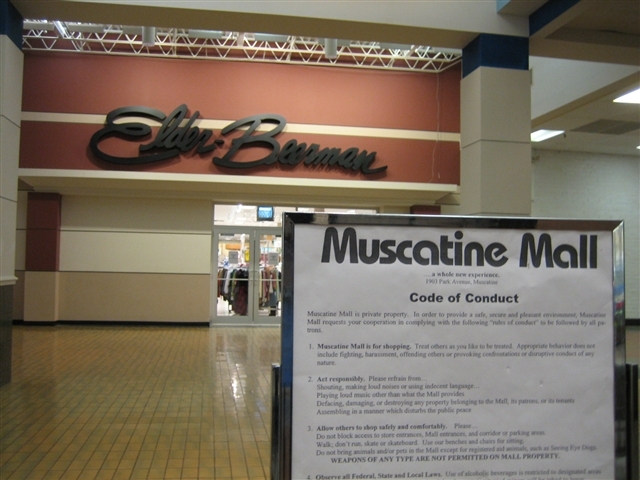 I’ve always wanted to revisit Muscatine and the mall, and have wondered what happened to friends and former employees, but it has never worked out. I have recently retired and hope at some time in the future I will. The mall is a complete piece of crap. Menards has indeed moved out. I haven’t been in it since August; I was only passing through and remembered I needed to renew my driver’s license. There’s a DOT office in the back. 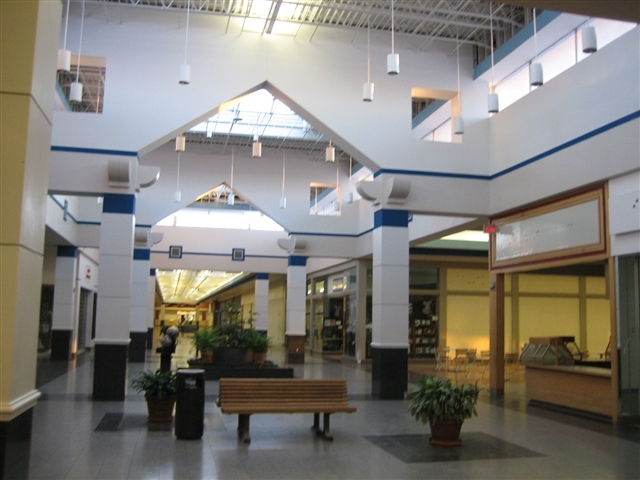 The mall is very similar in design and layout to Marshall Town Center in Marshalltown, Iowa. It also features a Menards as an anchor and went through a similar decline. I’m from Muscatine and the mall isn’t half bad now as far as the inside structure. The mall is mostly just a place for teens to hang out now and fell each other up =). Good times. They should mention that there used to be a diamond dave’s and an arcade in that dark corridor of the mall because that was an awesome hangout. There are 4 movie screens in the theater. Musca rules! I spent a lot of time as a kid at the Musc. Mall in the 70s / 80s. For the region it was ahead of its time. Thanks, David, for reminding me of Dinah the Minah bird…quite a local celebrity! The Woolco was at the north end, preceeded by Woolworth. Some memorable stores included both a Walden Books AND a B Dalton, Musicland, Maid-Rite, Baskin Robbins, Spencer Gifts, and an arcade called Land of Oz. It’s odd how important this place was to the community. We would go on a Friday night and the place would be packed. Lots of families, kids, teens, and even retired folks sitting on the benches by the fountains. It was like a town hall meeting with the smell of Karmel Korn in the air…. I was born in 1981 and raised in Muscatine and remember going to the mall as a kid. I loved the fountain they used to have in the middle of the mall right outside the indoor entrance to JCPenney, but they removed it in the late 80’s/early 90’s. My parents would take my sister and I to Diamond Dave’s (Mexican restaurant) for our birthdays. I loved going shopping at the Gigi’s that used to be there. I don’t even think they’re in business anymore. There was also a Vanity, Musicland, Claire’s, and KB Toys. I don’t live there anymore because I’m trying to finish my college degree, but I get sad when I go to the mall because I had such great memories there and now it’s almost empty. Wal*Mart actually was an original anchor on several identical malls in the midwest that opened from 1986-1990. 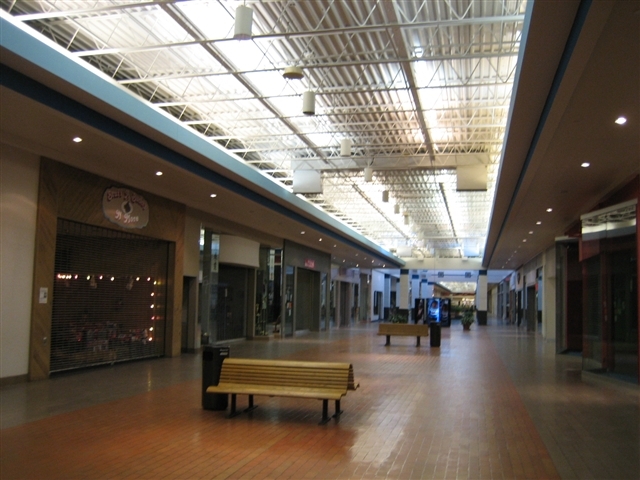 Prime examples were the Dial malls that opened in Ottumwa, IA (Quincy Mall), Aberdeen, SD (Lakewood Mall), Kearney, NE (Hilltop Mall), and Scottsbluff, NE (Monument Mall). Every one of these malls initially featured Herberger’s and Wal*Mart anchors on each end, with a JCPenney store recessed in the center. Wal*Mart has indeed vacated every one of these locations for exterior Super Center locations, the last one being Aberdeen in 2007. The only mall not to suffer from their exodus was Hilltop in Kearney, where Herberger’s revamped and took over the Wal*Mart space (talk about a remodel! 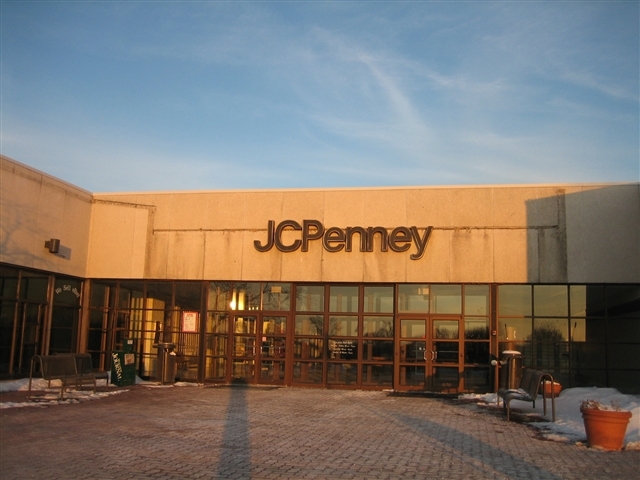 ), JCPenney took over Herberger’s former space, and Old Navy took over JCPenney’s former space. Speaking of Iowa malls, anyone know what the north anchor was originally? 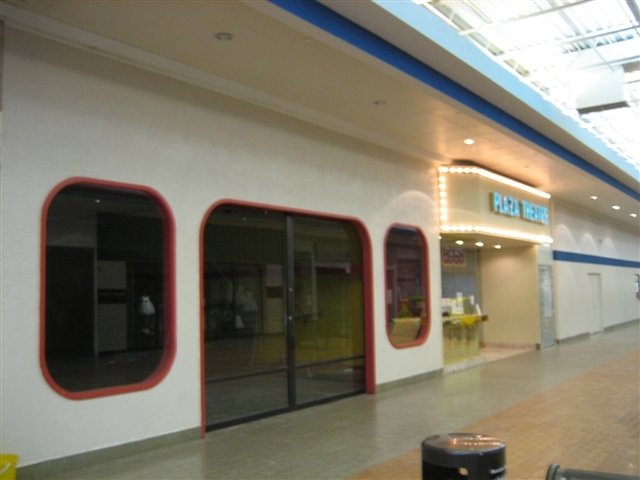 Storetrax, when they still had the mall listed, had this as Heilig-Meyers and a vacant spot. From what I can tell it later became Big Lots and the theater, and is now vacant. I have Woolco->Wal-Mart->Menards as the south anchor, and JCP and Younkers in the middle. Did this mall ever have a Von Maur? Sorry, i eamnt the north anchor at Marshall Town Center in my last post. Ahh yes… I remember this mall well. I did a live remote radio broadcast from this mall about 1998 or ’99 at a “grub pub” (I don’t remember the name) and gave away very cool expensive prizes as morning man of “93Country” and then again a live bizarre live broadcast as “Bryan Bradford” for KWPC @ Menard’s in 2004. What I remember best about this mall’s “Glory Days” happened sometime in the mid-80’s @ X-mas-time when I went to visit my brother & his wife who were living and working in Muscatine at the time and went X-mas shopping with him there. I remember t was quite bustling and very festive. I was impressed since I was living and working in radio in the Quad Cities @ the time and thought nothing in a small town, like Muscatine could be as busy as Northpark & Southpark mall. Hey I got a whole stream of pics of this mall up-to-date at my Flickr site…the mall is almost COMPLETELY dead on the inside now. I saw quite a few exterior stores like Hallmark, iWireless, an Auto Center (next to Younkers…gee, how attractive! *rolls eyes*), a TanWorld (which has it’s own mall entrance), and some others. The west entrance next to Menards has been redone and looks great…but there’s barely anything in it. The Younkers looks nice, and the JCPenney has improved their appearance, but they need to tear down that godforsaken damn old Menards/Wal-Mart/Woolco/Whatever the hell it was when they opened lol! It’s a BIG eyesore. They also need to think about repaving that parking lot…but sorry for nitpicking…just my opinion. Oh…I forgot….Regis and U.S. Cellular are the only two chain stores inside. And the Movie Theater has four screens…and it’s Muscatine’s only movie theater. I’m amazed it’s still going! it shouldn’t call itself the pearl of the mississippi, because there actually is a pearl mississippi and it doesnt compare! I was born in Muscatine and recently my parents and I drove through to see our old house and we passed by the mall. Muscatine is looking pretty sad these days, it seemed dirty and run down to us, it is mostly blue collar and the downtown was all torn up for some bridge or street project making it almost impossible to get around. Much of downtown was shuttered up, very sad. The mall from the outside looked like it was doing ok, after we got back I looked it up on here and see that its about 3/4 down the john. I agree with another poster that the old Menards needs to be torn down and perhaps a new multiplex theater could go in there. Then the old theater could be taken out and redeveloped into something else. There are alot of stores I think would do well in the mall, Old Navy, Family Dollar, Payless Shoes, Toys R Us Express, etc, it just seems like whoever owns it does not give a damn and besides some minor improvements it doing nothing to get major upgrades done. to bad, I would not want to have to drive the the quad cities everytime I wanted to go shopping. Bobby, the original anchor at the north end of Marshalltown’s mall was a Sears store. Had an auto center too, if you drive past it, you can still see where the garage doors were (they are bricked up). The Plaza theater is no longer in the mall. A new theater was built about 5 years ago.